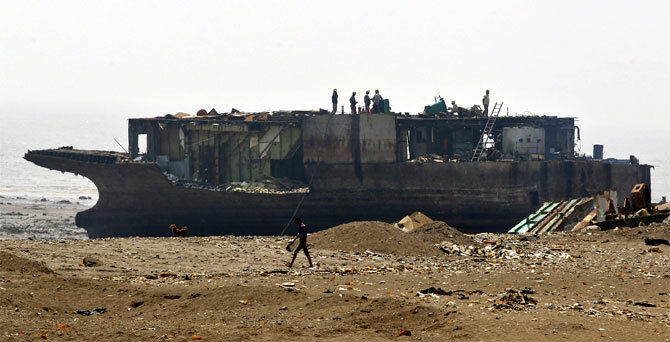 Rediff.com » Business » Is it end of the line for South Asia's ship graveyards? Is it end of the line for South Asia's ship graveyards? In the world's biggest ship recycling centre of Alang on India's Arabian Sea coast, workers with blow torches cut segments of steel stripped from the rusting hull of a towering cargo ship, sold for scrap by its Japanese owner. But in this town - located in Prime Minister Narendra Modi's home state of Gujarat - more than half of the ship-breaking yards have shut in the past two years and the future of the trade in India and neighbours Bangladesh and Pakistan is bleak. The industry has been hit by a flood of cheap Chinese steel and new European Union environmental rules due later this year threaten to push business to more modern yards in places like China and Turkey - in turn devastating local economies. "People are running this business from their heart, not from their mind," said Chintan Kalthia, whose company R.L. Kalthia Ship Breaking Pvt Ltd runs one of Alang's more modern yards. Still, he takes pride in the fact that after months of negotiations with a Japanese owner, his yard secured the biggest ship currently being recycled in Alang. "But this is my last ship. This business is dying," he added, suddenly sounding weary, as workers outside his beach-side glass office sized slabs of steel peeled from the ship. Ships sold to South Asian breakers, which control about 70 per cent of the market, are winched at high tide onto a beach, where they are taken apart by mostly migrant labourers. Equipment, such as radars, engines - and even tables and chairs - is taken off and sold, while the steel from the hull is removed for scrap. The trade in Alang used to employ about 60,000 directly, with thousands more in spin-off businesses, said yard owners. But roads on the 11 km (7 mile) beach front that locals say used to buzz with people and trucks now appear deserted and dozens of shops displaying everything from crockery to computers ripped out of ships are struggling to get supplies. "I used to make five, six, seven trips a day," said Munna, sitting atop his tractor with extra wheels able to carry heavy scrap from the yards. "Now I hardly get one or two calls." With a plunge in steel prices, ship owners are getting about $3.6 million less for the 25,000 tonnes of recoverable metal from a typical iron ore or coal carrying ship than just eight months ago. The finger of blame is being pointed at China. 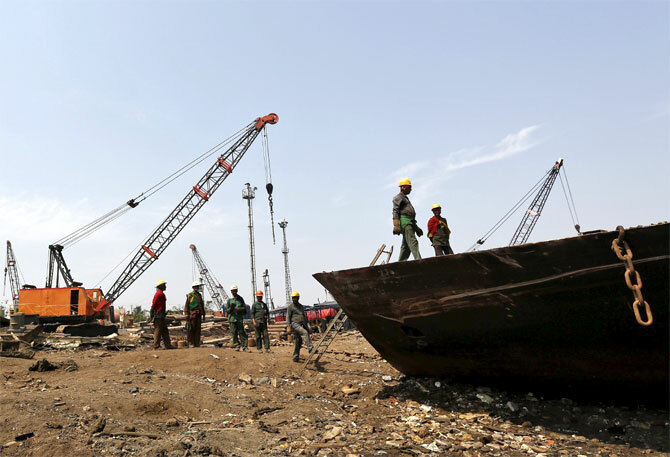 "China is selling below the price of recycled steel," said Amit B Padia, owner of Sagar Laxmi Ship Breakers, as an orange crane lifted a bathroom removed from a ship onto a trailer. 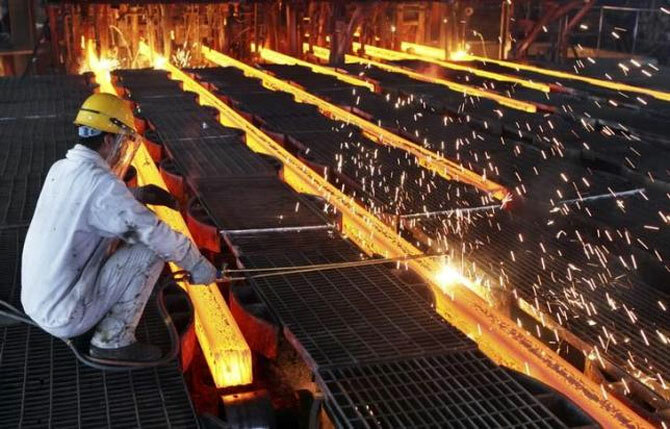 With China's economy slowing, its steel exports soared 51 per cent to a record 93.78 million tonnes last year and are up nearly 30 per cent in the first five months of 2015. 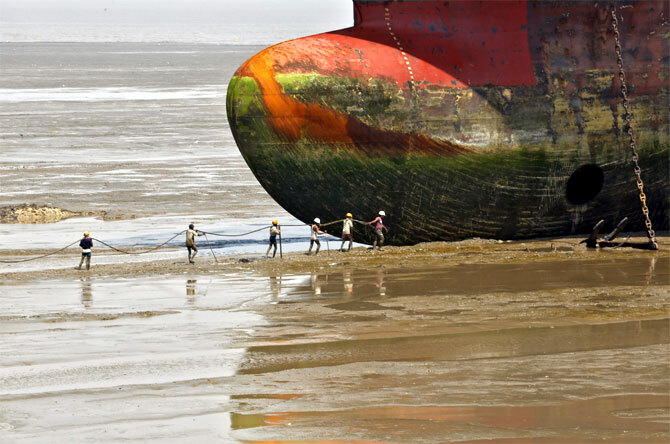 The impact has been felt in Alang where the number of active yards fell to 50 this year from more than 100 in 2014, according to the Ship Recycling Industries Association India. The number of vessels beached also dropped to a six-year low of 275 last year and was only 54 in the last three months, it said. The situation in Pakistan appears equally bad. 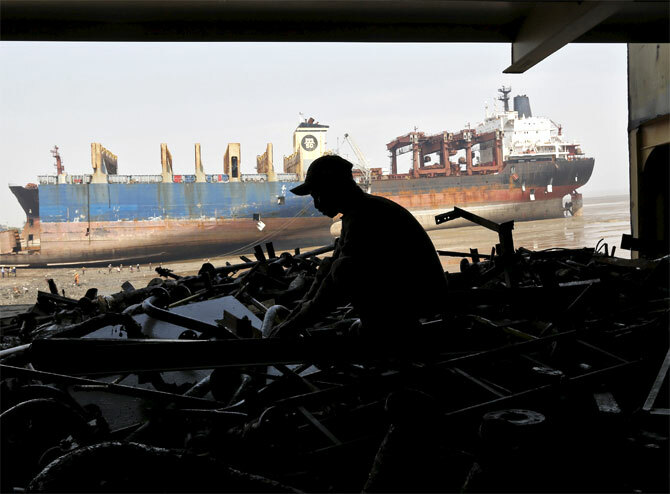 "It has always been a cyclical business but people who have been in this industry tell me this is the worst in 30 years," said Shoaib Sultan, the owner of Horizon Ship Recycling in Karachi. The story in Bangladesh is similar. "Three years ago there were about 80 yards, now it's down to 25. I think another 10-15 yards will go," said Zahirul Islam, director of PHP Shipbreaking and Recycling Industries Ltd in Chittagong. Ship breakers globally bought 25.2 million deadweight tonnes (dwt) of vessels up to early July, against 33.8 million dwt all of last year, with Bangladesh the largest buyer, according to shipping services firm Clarkson. "Everyone thought prices will improve and bought a lot, but now they are sitting on huge inventories," said Islam. "It will be a disaster in the coming months." It takes up to nine months for a typical bulk carrier in India to be broken up and its steel processed, said Rakesh Khetan, chief executive of Singapore-based Wirana Shipping Corp, a major buyer of ships for scrap. As well as facing pressure from cheap Chinese steel, there are also calls to stop beach scrapping because of the danger and environmental damage from pollutants left to drain into the sea. Highlighting the risks, five people were killed and at least 10 injured after an explosion in a chemical tanker being dismantled in Alang last year, local media said. Workers can also face health hazards such as lead paint and asbestos when working on ships. The European Commission will introduce tougher environmental controls some time after December. While not specifically banning beach scrapping, owners of ships registered in EU countries will have to scrap them at approved facilities, a move that could favour countries such as China and Turkey where ships are taken apart in docks. "The European Commission's intention is not to discourage vessel owners from using facilities outside of the EU but to discourage ship owners from using facilities which have proven to present very real danger to life and the general environment," said Mark Clintworth, head of shipping at the European Investment Bank. In a bid to allay environmental concerns, some yards in South Asia have cemented their work area to try to prevent seepage of oil or chemicals, but many lack the money to do this. "It takes about $5 million to improve a yard. How can somebody do that when they are bleeding?," said Islam of PHP Shipbreaking in Bangladesh. Clintworth said his bank and the European Commission could provide investment for South Asian ship scrappers to improve existing operations, as well as for safer and more environmentally friendly new facilities. But for many that could come too late and some, including Alang's Sagar Laxmi Ship Breakers, are simply targeting other industries such as construction.